Nurul Izzah Anwar, 'Puteri Reformasi' and newly elected Member of Parliament for the Lembah Pantai constituency in Kuala Lumpur, Malaysia. A new face in mainstream Malaysian politics, she humbled her opponent at the recent elections and is lauded as Pakatan Rakyat's voice of the young. Is she a politician to be taken seriously? Journalist Imran Imtiaz Shah Yacob gets the views of this aspiring legislator. This interview was posted on Malaysia Today. Imran Imtiaz Shah Yacob: A number of Malaysians lament that parliamentary sessions were rather ineffective as far as the Rakyat [citizens] was concerned. Politicking and heckling was the order of the day. Comment? What was your experience? Nurul Izzah: Parliament for me was both at once daunting and exciting. The ferocious beginning with little decorum showed certainly shocked many, including myself. But the sessions proceeded well into a forum of critical discourse and, at the very least, kept the government on its toes. The mere half an hour allocated by RTM [Radio Televison Malaysia] does not depict the entire picture. As the hours progressed, issues such as the lack of medical personnel in our public hospitals, the excessive spending on questionable projects, as well as the unbelievably high additional expenditure on top of our allocated budget (unplanned but spent!) last year are unearthed. Nonetheless, I admit the nature of our parliamentary system is such that substantial debates that go into detail of the issue at hand are not able to take place, since we are restricted to general debates in the absence of a specific committee such as the Public Bill committee in the UK, which provides for a more detailed examination of bills, thus more scrutiny and time for real debates. Most issues raised in the recent session only grace the surface. Still, it's hardly fair to depict the entire proceedings as mere ruckus - bits of it, perhaps, certainly not all. I must add, however, years of two-thirds control by the BN [Barisan Nasional] have taken its toll. Our parliament has always been perceived as a mere rubber stamp - even now, with the BN denied its two-thirds majority, we're still unable to reject, such as the Supplementary Supply Bill, which included funds for Le Tour de' Langkawi, the Champion Youth Cup soccer tournament and the dissolution of SUKOM Bhd. Nevertheless, with the increased representation of opposition MPs, we hope to level the playing field, and further strengthen the role of parliament as a legislative body in our democracy. This will be a process in progress, one that requires continuous public support, scrutiny, and pressure. I do believe in the need to continuously televise parliamentary sessions so that the public will be able to aptly judge the behaviour and intellectual capacity of their chosen representative. Public scrutiny will help drive MPs to conduct themselves appropriately. Observers think that voters were generally disenchanted with Abdullah Badawi/Barisan Nasional and that any alternative candidate could have won in the recent general elections, including yourself. What's your view on this? The recent electoral results were, in actuality, a humbling victory for all of us. I take it to represent the will of the constituents braving the onslaught of unparalleled media bias, BN mega machinery, and electioneering at work to follow through with their agenda for reform and push for real change to take place. Pure and simple, it was the people at work. Nonetheless, I take full pride in what we do. We came in at a time when the incumbent was at its peak. The years of hardship previous to the 12th General Elections certainly tamed our expectations. But we persevered all those years, and made a decision to present the electorate in Lembah Pantai with a choice of an alternative representative for them. We then maintained a focused, structured campaign throughout the 13 days. It was a tough fight, and I could feel the mood of the people change in the days that went by. There were opportunities accorded for an alternative, yes, but I believe a clinch was required before the voting deal was sealed. That clinch must come from the belief someone puts in me. And I plan to honour this belief, by doing my best as their elected representative. In a three-cornered fight such as ours, personality does count. Especially in fielding such a popular, well liked, and media savvy personality such as Datuk Shahrizat Abdul Jalil. One must never underestimate your opponent, and always focus on the issues affecting the Rakyat. It took courage for any candidate to contest against BN even with knowledge of all the unfair obstacles they would face. And all PR [Pakatan Rakyat, or People's Alliance] candidates, win or lose, have shown that they are committed to the cause and willing to step up to the plate. I think that shows an important quality in all our candidates and the voters believed in them. At the end of the day, you would not vote for someone whom you believed could not do the job. There are already rumblings on the ground about Pakatan's failure to keep to their incredible election promises. In your instance, Lembah Pantai is a real mix of voter types. Can you really deliver? Pakatan Rakyat promised democratic, transparent and accountable governance, a new economic agenda promoting vibrant growth, equity and power eradication based on need. I claim all these goals are being diligently pursued, if not yet realised, in the five states being ruled under this credo. To the extent that these goals are deliverable by the Pakatan state governments in power without federal obstruction, they are certainly being seriously pursued. Thus, there is no faulting real political will that exists within the Pakatan leadership. Nevertheless, we came in at a time when political awareness is at its peak. And with this inevitably comes very high expectations. It would certainly help a lot if the mass media, including the much-discredited Utusan Malaysia, would help in providing fair coverage of Pakatan efforts and responses. But pockets of resistance at the federal level, coupled with a hostile media (Malay medium, especially) are not helping our efforts. Take, for example, the water issue; the Selangor government has formally written to the federal government to take over all water-related assets in the effort to provide the first 20 cu m of water per household for free. But the federal government might end up fixing the profit margin level - rendering state efforts thus far, meaningless - so in a lot of areas, like it or not, there is the state-federal conundrum. These are challenges that will ultimately strengthen our resolve and capability as governments. This is good we've had enough practice being the opposition. And competing with the federal government brings out the best in everyone. As to Lembah Pantai, I believe in forging a partnership with the community. My main objective is to replace the culture of political patronage with community-based volunteerism. In Lembah Pantai, the problems are manifold. But public safety issues, as well as an unaccountable municipal council cut across race and class. These are shared concerns in an ethnically and socially diverse constituency, which provide the chance to organize initiatives that can be participated by all. Of course, there are challenges to be overcome. In terms of City Hall related issues, I think all the Pakatan MPs in Kuala Lumpur, numbering 10 out of the 11 in total, are trying our best to ensure that municipal services are extended to all constituents, irrespective of whether they live in the poor areas or in affluent suburbs. But instead of having that additional edge of controlling KL, in ballot counts, at least, we fall prey to the Federal Territory Act, which unfortunately renders us mere MPs at the mercy of City Hall and the Ministry of FT [Federal Territory]. Such an autonomous and all-powerful body does not answer to anyone. Thus, City Hall response is often unpredictable. But we continue to push, and I choose my battles carefully. We need to facilitate close cooperation in the interest of the public. But of course we cannot compromise on basic principles of right and wrong. We are now operating our community development centre in Pantai Dalam, and are seriously on the lookout for volunteers. The choice differs from previous predecessors, but is made after serious consideration with all parties concerned. We are working on three main issues at the moment: facilitating transfer of squatters in various places - housing, ensuring people participate in objecting to discrepancies existing in the draft of the KL local plan - environment, and planning a long-term program to curb crime in key areas. 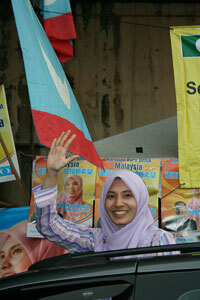 You are the embodiment of a fresh face in Malaysian politics as well as the daughter of Anwar Ibrahim. Thus, how will you as a young parliamentarian make a difference for the young across the board and not just in terms of Keadilan's/Pakatan Rakyat's struggle? To move the young you have to show that you can make a difference, not by gimmicks or posturing, but sincerity, which is executed through planned and patient endeavours. We have to get the young interested in their political destiny. That is the main objective of my active involvement in politics. It is distressing that the majority of the four-million-plus citizens who were not registered as voters at the time of the last election was in the age group between 21 and 35. This is evidence of an apathy that is not healthy for the workings of a parliamentary democracy. If I can show citizens, male and female, that a young and concerned person who is willing to enter and be bruised in the political arena can still emerge to fight for a better future for all, then more young people will be encouraged to take part in the political process. Do you agree with the government's announcement to substantially increase the allocation of scholarships to non-bumiputeras? I support policies that assist the poor and the deserving. I note that the quantum of the overall allocation is higher than before such that bumiputeras do not lose out. This is not a zero sum issue. Deserving non-bumiputeras need help while the level of help to deserving bumis must be maintained, if not increased. What's your observation of the government's efforts to contain inflation? It is not succeeding. The best way to contain inflation is through the practice of transparent governance through combating waste, mismanagement, corruption and cronyism. Too much of the nation's wealth has been misallocated and corruptly streamed. This must stop. Additionally, the government seems unprepared with the execution of its own safety nets (cash vouchers, fleet card mechanism, etc) in the face of the petrol hike. This can spell disaster in terms of spiralling inflation. Do you think that the government's move to remove the subsidies as announced for diesel, gas and petrol is justified? Removing subsidies without sweeping away corruption, nepotism and cronyism is like putting the cart before the horse. First things first, the whole concept of subsidies is based on the need to use the nation's raw material wealth to get people on to a standard of living that enables them to become players on a more level playing field. As they ascend the ladder of economic well-being, you gradually reduce the subsidised part of their livelihood in such a way that it does not abruptly diminish their purchasing power. The way this government has sharply increased petrol and diesel prices at the pump in the last 18 months has directed attention to the way Petronas disburses its huge profits. This is a matter under wraps and this has provoked a great deal of concern that the wealth of the nation is being secreted into channels that show it cannot bear discussion and publicity. The 13th General Elections to be held will see a great number of young voters coming to the fore. How will you reach out to them as opposed to UMNO's efforts? It will see a huge number of young people voting provided they actually register to vote. To ensure that they register to vote, a scheme is being devised for registered voters in states in which Pakatan Rakyat is in power whereby the can participate in a programme that would bring good returns. It's a no-participation without registration scheme. It is an attractive one but the catch is you have to register as a voter to take part. As to reaching out to young voters at the next general election, there is no better way to achieve that except to ensure that young elected representatives from Pakatan have succeeded in their roles and still exude idealism. This will convince the young that a vote for the younger set of reps is a vote for a better future. It appears that you haven't championed women's issues as much as was anticipated. Comment? What advice would you give to ambitious women politicians? Actually, one of the first things we've done in the first parliamentary session was to form a women's caucus. Having said that, I would like to say that I'm interested in all the issues that affect the citizenry. And women's issues, such as adequate child-care, our archaic labour laws should be mainstream and never compartmentalized as belonging to one particular gender. These are issues that must be championed by everyone. As a young mother, I can say with certainty that it is extremely challenging to be involved in politics at this level. Politics is very much still a man's world since the rules is made in an arena dominated by men. I urge more women to get involved, as this would very much improve the climate and subsequently ease the process for female involvement. Mothers have first hand experience on child development that ultimately contributes to the type of society that emerges. We cannot have a wholesome approach to nation building if a large sector of this group is not represented. It is extremely disappointing to see a person who had worked and suffered for the cause of reformasi, and under the hands of an UMNO-dominated government to embrace that very institution, which I regard as redundant. We are moving towards the future, one that is defined by principles in the spirit of real multiracial cooperation. I think most of us are deeply involved in strengthening Pakatan Rakyat, as well as cultivating a close spirit of cooperation between young leaders in PAS, DAP and KEADILAN. So, the Ezam issue does not arise. It belongs to a past, which is divorced from our reality today. If you met [Malaysian prime minister] Abdullah Badawi today, what would you, on behalf of the youth of Malaysia, say to him? Actually, I did have an opportunity to meet and have tea with him, along with many other officials during the recent Vesak Day Celebration at the Buddhist Maha Vihara, Brickfields. I would regard the meeting as very cordial, which even included an exchange on grandchildren-related issues! Anyhow, back to business: I think I would urge him to fulfil his promise of implementing reform when he first assumed power in 2004. This means taking difficult decisions, which do not include a harsh cut (40.6 per cent at that) of subsidies. The increased petrol and diesel prices and the way it was announced, to the shock of everyone, only goes to show that the BN government has not learned its lessons. The Rakyat yearns for transparency, and sincerity. At the very least, a real debate on this issue should have taken place in parliament at the last session. - Disclose Petronas' accounts to the public - a detailed one at that. - Restore the previous subsidies on petrol and diesel - at least until the safety net mechanisms are properly put in place! And you could stagger the slash, instead of lumping them up together. - Listen to qualified policy makers instead of political make-maybe not makers. - More importantly, do seriously consider a two-party system, which will only benefit the people? Pakatan Rakyat's focus at ALL times. Would you like to send a message to the Rakyat? Keep the faith in Pakatan. We are not knights in shining armour. We are fallible people striving to match deed to promises in a journey of a thousand miles in which every day we take single steps towards a new dawn for Malaysia and a new deal for its citizens. Note: Imran Imtiaz Shah Yacob is a trained lawyer and Malaysian political commentator. He writes for numerous international newspapers and online journals as well as hosts Face to Face, an interview segment of Malaysian/regional issues and personalities hosted on Malaysia Today. He also serves as Foreign Correspondent for foreign news organisations. Face to Face interviews are conducted by way of e-mail unless otherwise stated. The above article was posted on www.malaysia-today.net (Your source of independent news). Raja Petra Kamarudin started the Malaysia Today website and his blog to facilitate open discussion on Malaysia's political and social scenes. A relative of a former Malaysian King from Selangor and known for his hard-hitting commentaries, which are often infused with humour, Raja Petra is also the author of When Time Stood Still and From Prince To Prisoner.